From an early age, Bob Hoover had a love for aviation, soloing on his 16th birthday. He and some friends rebuilt a Taylor E-2 which Bob barnstormed all over Tennessee. He enlisted in the Tennessee National Guard and, after the outbreak of World War II, was sent for pilot training with the Army. Sent to Casablanca, he served as a test pilot at a repair depot, flying almost every aircraft in the Allies' arsenal. Bob eventually saw combat flying Spitfires with the 52nd Fighter group. Shot down by a FW-190 off the coast of Southern France, Bob spent 16 months as a German prisoner of war. In April 1945, he managed to escape from the prison camp, stole a FW-190 (according to his own biography), and flew to safety in Holland. After the war, Bob went to a Flight Evaluation Group at Wright Field, OH where he was able to fly captured German and Japanese aircraft. A desperate bailout from an F-84 Thunder jet shattered both Hoover's legs, dashing his hopes of flying the X-l. Later, when Yeager was asked who he wanted on his flight crew for the supersonic Bell X-l flight, he named Bob Hoover, who became Yeager's backup pilot, flying chase in a Lockheed P-80 Shooting Star during the Mach 1 flight, and in an F-16 for the 50th anniversary. Going to work at North American, Bob tested the FJ-2, the F-86, and the F-100. Going beyond the call of duty, he flew combat missions with Air Force squadrons in Korea, demonstrating the capabilities of the F-86 over enemy territory. Hoover was the first man to fly the XFJ-2 Fury Jet and the Navy's T-28 trainer. In the 1950s Hoover began flying an acrobatic routine with a P-51 Mustang, then the T-39/Sabreliner and the Aero Commander fleet, and the Shrike Commander 500S. He set altitude and speed records and was routinely sent abroad to demonstrate aircraft. During one of his most popular stunts, Hoover poured iced tea from a pitcher into a glass set on his instrument panel while performing a perfect barrel roll. He served as captain for the 1966 U.S. Acrobatic Team. Hoover has flown more than 300 types of aircraft and performed at more than 2,500 civilian and military air shows. 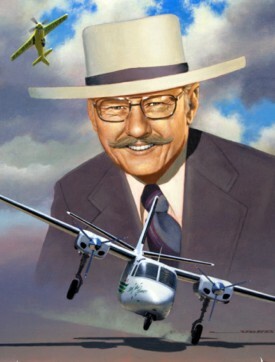 Considered one of the founding fathers of modem aerobatics, Bob Hoover was described by Jimmy Doolittle as, "...the greatest stick-and-rudder man who ever lived." In the Centennial of Flight edition of the Air & Space Smithsonian, he was named the third greatest aviator in history. Hoover passed away on Oct. 25, 2016.